to go on and develop some ‘proper code’. I had previously looked at David Whale’s python ‘microbit’ module and this seemed a great way to get the text strings ‘into’ the micro:bit, which solved the problem of how to front end the display. The remaining s/w built used in my distributed micro:bit clock. This is a simple python app you need to download on to each of the micro:bits that form the message display. 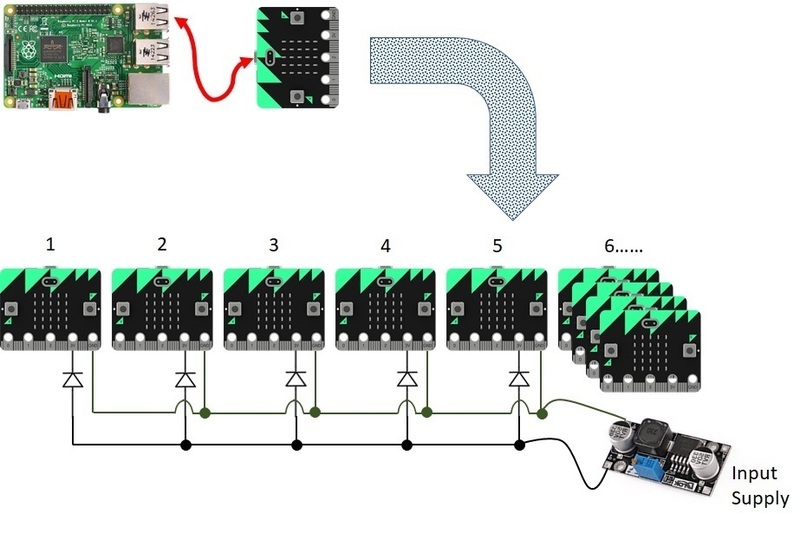 The s/w for each micro:bit is identical. The software listens using using the radio function for any messages addressed to it coming from the gateway micro:bit displaying any valid character using the display.show function. It will keep displaying this until it receives a new valid message. The address of each display node is set the first time the s/w is run (normally this would be directly after download). The micro:bit will display a ‘?’, to show the address needs to be configured. The address is set using button ‘a’ and once correct store it using button ‘b’ – the address is stored in non volatile memory. On subsequent restarts it will be automatically selected, but you can change it by holding down button ‘a’ and resetting the micro:bit. This is a somewhat more complex python app, performing 4 functions receiving messages from the Pi, creating the scroll effect, segmenting the message and finally transmitting the individual character information to the display node micro:bits. Information is received from the Pi via a USB connection, this is described further in the RPi gateway application section. The basic message format is <type><message>. ‘type’ is either ‘1’ to display a static message or ‘2’ for a scrolling message. So for examples if the gateway micro:bit receives the following message ‘2HELLO WORLD’ you would see ‘HELLO WORLD’ scrolled across the display node micro:bits. This would be repeated until the next message is received. Static messages are automatically truncated to the number of characters in the display. If you want to see how the scroll process works the best way is to look at the python code but in simple terms I create a shift register in s/w and simply cycle it. The gateway micro:bit needs to know how many display nodes it is talking to, this is set the first time the s/w is run (normally this would be directly after download). The gateway micro:bit will display a ‘D’, to show the number of nodes needs to be configured. This is set using button ‘a’ and once correct stored using button ‘b’ – the number is stored in non volatile memory. On subsequent restarts it will be automatically selected, but you and change it by holding down button ‘a’ and resetting the micro:bit. The GUI app is my first real attempt to use Tkinter and I am sure I have broken a number of, but it seems to work and was interesting to code. Holes with 2.5mm screws gave a bit of ‘slop’ to get everything aligned neatly. You can find a copy of the dimensions I drilled to at the end of this post. Initially I just used individual batteries to power each micro:bit. Once I was happy the with the mechanical arrangement I found a suitably rated 3.3v supply and changed to power the node micro:bits via the GND and 3v pins – if you go down this route you need to be very careful as an error here could end up destroying all the node micro:bits. Also most importantly you have to include a diode on the 3V line. You can have a look at some short videos of the scroll display working on my YouTube channel.